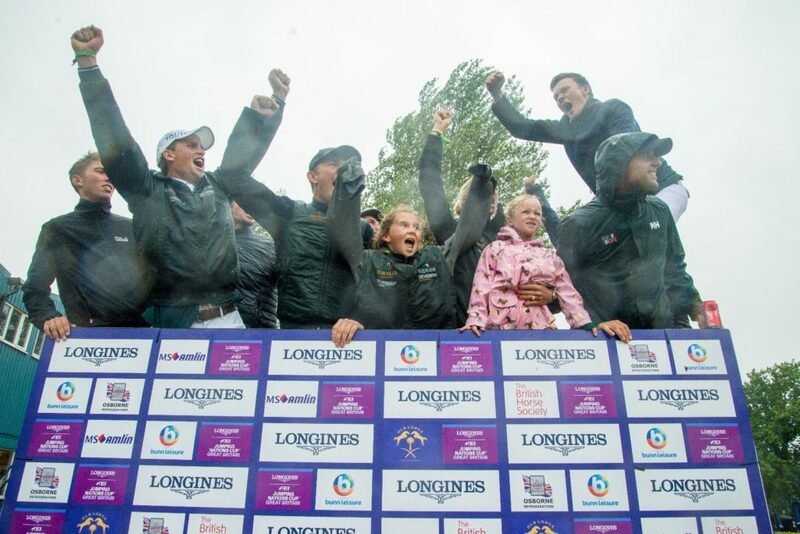 The Irish Show Jumping team have claimed a stunning victory in today’s Longines FEI Nations Cup of Britain at Hickstead, with the result moving Ireland up to third place on the league table and in the process are guaranteed a place in the 2018 Nations Cup World Final in Barcelona. The heavy rain which lasted for almost the entire afternoon only added to the drama, as Ireland and the home team from Britain played out a thrilling battle, with a jump-off eventually needed to separate the top two teams. Ireland were level with Britain at the halfway stage on eight faults apiece. Tipperary’s Trevor Breen looked to be heading for a clear round with Bombay when first to jump, before the last fence fell to leave them with four faults. Kilkenny’s Richie Moloney jumped a perfect clear with Freestyle De Muze, while Galway’s Michael Duffy (EFS Top Contender) and Waterford’s Anthony Condon (SFS Aristio) both finished with a fence down each. Breen repeated his four fault score second time out, before Moloney also came home with a single error. Ireland were coming under real pressure from Britain, especially when Amanda Derbyshire jumped clear with The Irish Sport Horse Luibanta BH. Duffy then delivered a vital clear which guaranteed Pessoa’s team at least a jump-off. 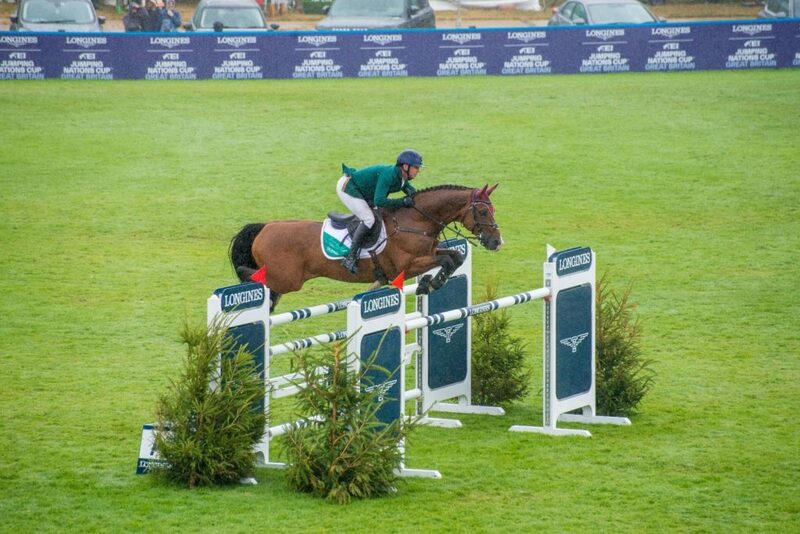 Condon could win it with a clear when last to go, but he had an early rail down and knowing he could not improve Ireland’s 16 fault total, he decided to retire and save his horse for the jump-off to follow. Holly Smith was selected to go against the clock for Britain with Hearts Destiny and put down a tough target when jumping clear in 43.39 seconds. Condon set off at a good pace with the John Hales-owned Aristio and were in touch midway through the round. The long-striding son of Arko made up huge ground on a daring gallop to the last and when they crossed the line clear in 41.29, victory would go to Ireland sparking wild celebrations in the Irish camp. Britain finished second ahead of Brazil in third and Sweden in fourth followed by Belgium, Italy and The Netherlands. 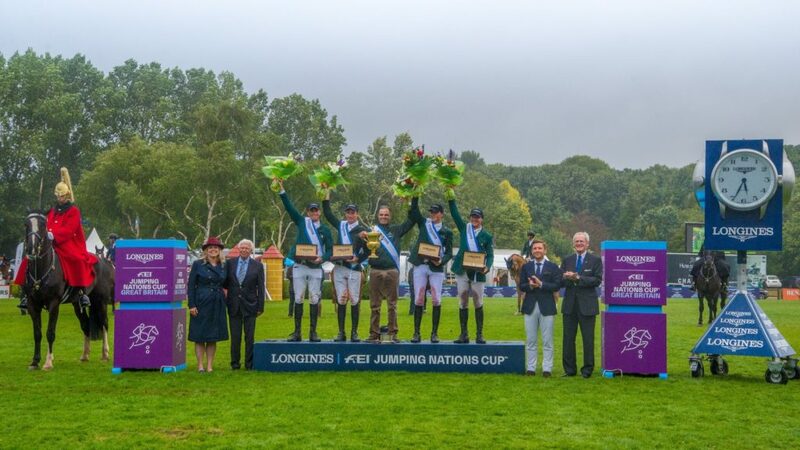 Ireland now turn their attention to the final Nations Cup in Europe Division 1 on at the Dublin Horse Show on Friday August 10th, where the coveted Aga Khan trophy will be up for grabs. 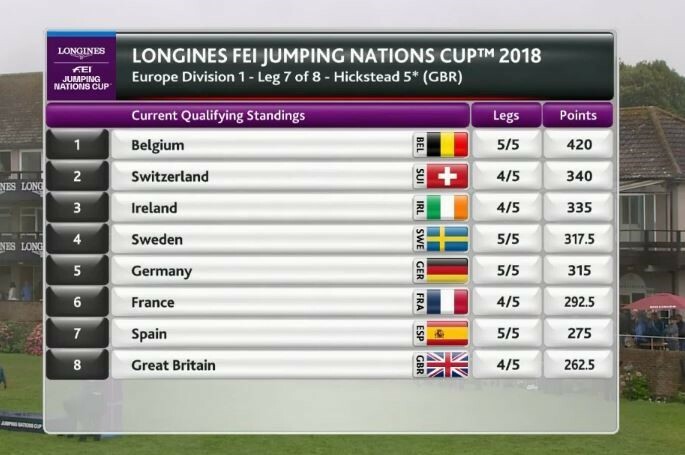 Victory on home soil could see Ireland finish on top of the Longines FEI Nations Cup league table in Europe Division 1.